I live in Michigan's wine country. I love wine. When you can't find me in the summer or fall, chances are, I am wine tasting. I use to only like sweet whites. What a silly young girl I use to be! Now, I thoroughly enjoy a full bodied red as well as a nice, sweet dessert wine. When I was researching organic wines on the internet, I discovered an amazing company called Parducci. Their winery was founded in 1932 and it is the oldest winery in Mendocino County. Mendocino WIne Company is a partnership of the Dolan and Thornhill families. Today's owners and employees are committed to responsible land stewardship, sustainable viticulture and green business practices that yield superior grapes while protecting the environment. Parducci also uses Biodiesel to fuel their tractors and cars and solar panels to run 25% of their power needs! They have more panels to come. One other impressive aspect of Parducci Winery is that they use 100% post-consumer (New Leaf) and tree-free (Kenaf) papers in packaging, point-of-sale, stationery, brochures and all other printed materials. We use both post-consumer recycled papers (to reduce consumer waste) and tree-free papers (to avoid cutting down forests). Parducci Family Farmed case boxes are made from chlorine free corrugated. "Food friendly wine from Eco-friendly vines" couldn't be more accurate. They sent me a bottle of their Sustainable White which won 1st place-Light New World White Wine Out of 50 wines under $15 tasted. I can see why. I brought this bottle over to my in-laws house and we enjoyed it with brie cheese, pears and apples. It was fresh, unique and crisp. My in-laws, who happen to be winos, just like me, really liked it. To quote my father-in-law "with the Sustainable White, I had no expectations like I would with a Chardonnay or Pinot, it was my favorite." This is pretty exceptional because I thought that my mother-in-law and I were going to drink wine and the men would drink beer but I caught my FIL pouring his own glass of the Sustainable White! I would definitely buy it and drink it for any occasion, it was that good. You certainly cannot go wrong for $10.99 a bottle!! They also sent me a bottle of the Parducci Signature Pinot Noir. It was light and delicious. We paired it with a New York Strip steak and baked potatoes! One thing that I really liked about this particular Pinot Noir was that it wasn't overly heavy. It allowed me to enjoy both the food and the wine at the same time. You can buy this Signature wine for $24.99 and let me tell you, it is worth that nice price tag. Old vine Chardonnay? The vineyards that provided grapes for this wine were planted in the early 1970s, with low-yielding older varietal clones. A cool-site vineyard north of Lake Mendocino, and a warmer-site vineyard near the Russian River in Hopland, combined to make this elegant wine. 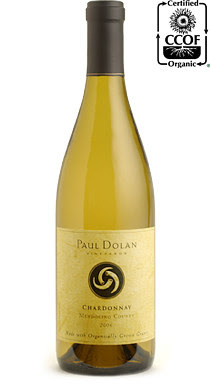 Pear and winter citrus fruit character is complemented by creamy vanilla spice. This wine is the unique expression of a carefully nurtured piece of land, made manifest in each bottle. We do without conventional pesticides and synthetic fertilizers, treating the soil as a living, lifegiving system. Our winegrowing practices create special wines, while sustaining our environment, the place where we live, and the people who live here. If I could sun up my Mendocino Wine Company tasting I would say that not only was I impressed with the eco-friendly practices of this amazing winery but their wine was really tasty. It exceeded my expectations for an "organic wine". And let me tell you, after sharing three bottles with one person *minus my father-in-law's glass* I didn't even have a wine hangover the next day---THAT IS WORTH IT'S WEIGHT IN GOLD!! Thanks for the great review. We are always in the market to try something new. Now I just have to go hunt for it. Thank you for your kind words about our wines. Please stop by the next time you are in Mendocino County because we'd love to show you some of our newest green projects - chickens and owls boxes in the vineyards, new bee hives, and an on site wetland. Thanks again for your passion for all things green! I am just as passionate as you are about the environment and our health. I've been searching and have tried some organic wines. Unfortunately, they haven't won over my DH, but I shall try these. Thanks! Just found a fabulous organic wine in Georgia. If your interested I'll email you the vineyard name when I get home. This looks like a great addition to my wine list. Thanks for the review. "Dental packages in Costa Rica include all costs like X-ray, prosthesis, etc., in the clinic, along with the dentist's costs, and however they are 50-70% less expensive than everything you will uncover inside the US, UK, Canada."